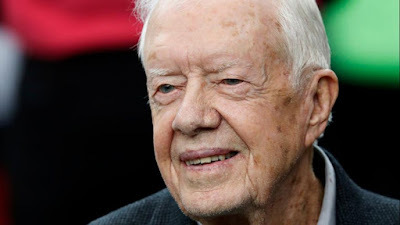 Jimmy Carter who is a former President of the United States was apparently treated for dehydration. He is currently 92 years of age. He was also in Winnipeg helping volunteers build a set of stairs. Jimmy Carter was attending a charity project. Jimmy Carter was a United States President from 1977- 1981 and he were sadly diagnosed with cancer. More specifically Melanoma and was treated with an immunotherapy drug. He then came out and said that after receiving scans there were no signs of cancer. The former president was reported to have started feeling weak after two hours in the sun. Manitoba Families Minister Scott Fielding said: “He had just said that he needed to take a break and so he sat down — there was a chair that was close to him,” “He sat down there and his secret security were there as well. They hydrated him, giving him some water and some Gatorade. It is said that he was taken to a nearby trailer and then an ambulance arrived to take him to St. Boniface General Hospital. His wife was also at the project and was said to have been by his side at the hospital. His wife's name is Rosalynn. Scott Fielding said: “We were out in the hot sun, and you’re doing a lot of work. No matter what age you are, you’re going to get dehydrated,” Which is true. Keeping hydrated is often something that people forget to do when they're out in the hot sun. He was aiding an organization that builds houses for people who are low income. The organization is known as Habitat For Humanity. According to the chief executive officer at Habitat For Humanity International mentioned that he was fine and that the hospital was a precaution for safety. The former President and his family have had a past history of helping out charities by volunteering their time.